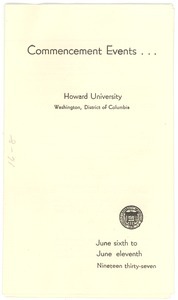 Washington (D.C.) - An outline of the various events, functions, and class reunions to be hosted in and around the University's 1932 commencement ceremony. New York (N.Y.) - Working to establish a socialist America. Boston (Mass.) 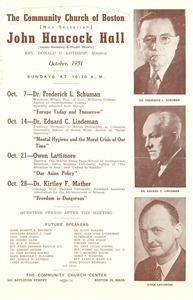 - Advertising the Church's October program, feaaturing addresses by Frederick L. Schumann, Eduard C. Lindeman, Owen Lattimore, and Dr. Kirtley F. Mather, and noting W. E. B. 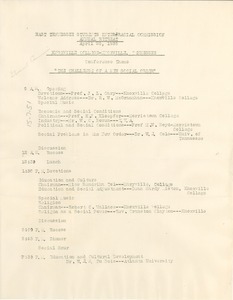 Du Bois as among the "future speakers." 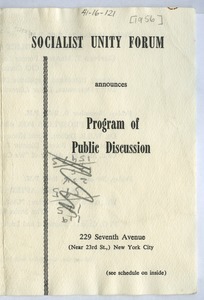 New York (N.Y.) - Inviting participants to conference on peace; contains signatures of sponsors; list programs to occur at the conference; features a speech by W. E. B. Du Bois; registration form to be filled out. 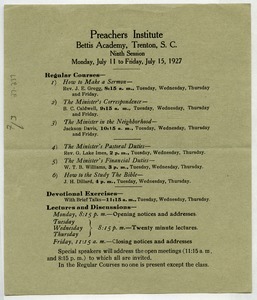 Trenton (S.C.) - Outlining the regular courses, exercises, and discussions to be held at the 9th session of the Institute at the Bettis Academy. 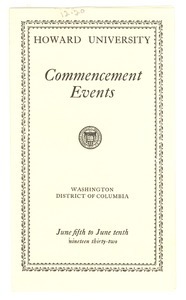 Washington (D.C.) - Delineating the daily events held as part of the University's commencement week program. Rochester (N.Y.) - Schedule of lecture program from November through March. 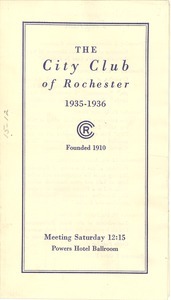 Also lists officers and board, provides membership enrollment form, and describes club. 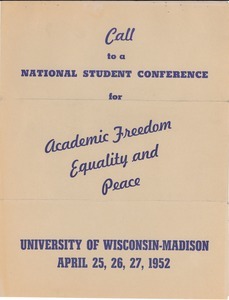 Madison (Wis.) - Describing the timeliness, goals, sponsors, and tentative program of the April 25-27 Conference for Academic Freedom, Equality, and Peace. Knoxville (Tenn.) - Concerns schedule of events of day-long retreat at Knoxville College, with the theme "The Challenge of a New Social Order." Lists as the final event a talk to be given by W. E. B. Du Bois in the evening. 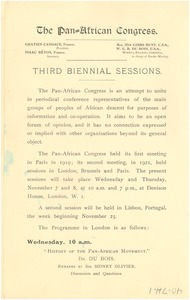 Paris (France) - Topics to be discussed and participants of the London session of the third Pan African Congress. Participants include: W. E. B. Du Bois, Ida Gibbs Hunt, Harold Laski, Kamba Simango, Sidney Oliver, John Alcindor, Chief Amoah III, H. G. Wells, and J. H. Tawney.